Are you searching for a reception location for July 7, 2007? While I won’t be in the country for a wedding on 07.07.07, my associate Dana will be here and the Hyatt Hill Country has an opening. 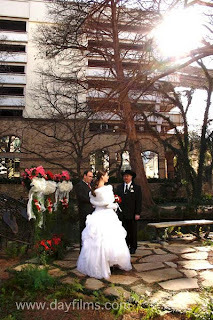 They have three great locations on their property for a wedding reception. Please give Charity Johnson a call if you are interested. 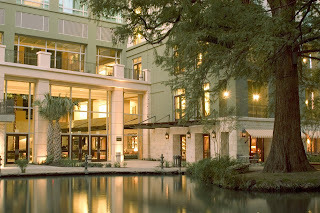 Her number at the Hyatt Hill Country is 210.520.4073. Please email us if you are interested, in weddings or just the travel. Minverva is our travel agent and can help you with anything you need. If you opt for a last minute wedding in Mexico, just tell us where you want to go and we’ll handle the rest. Fares do not include government imposed taxes, fuel surcharges and security charges, such as the September 11th Security Fee that amount to approximately $150 per person. Tickets must be issued on/before February 22nd, 2007. Fares are non-refundable, and changes to flight and/or date may incur a fee of up to $100 per person. One stopover in Mexico City permitted free of charge. Fare is subject to change without previous notice. All advertised fares are for general information and not a reflection of current availability. Many of you who know me, know that I support foundations who support persons with disabilities. I hope to see you there! Thank you to Tesora, KSAT, Coca-Cola, GMAC Financial Services and HEB. Special thank you to the wonderful minister, Keith Thompson and his lovely wife Becky of Simply Ceremonies for the referral. Becky knew Glenn needed help and with in one day, we pulled it together. Give guests the royal treatment and transport them in style. The bride and groom don’t have to be the only ones to enjoy this romantic ride. Cedar Knoll Farm in Lisbon, CT, has a 12-person horse and carriage called a wagonette that is often used to transport wedding guests short distances. The black wagonette with walnut panels is typically pulled by two horses (brides choose the type of horse) and can be decorated with silk flowers and bows in the couple’s wedding colors. “A lot of people get a big kick out of it,” says owner Elaine Keeley. Rates start at $750 for three hours, cedarknoll.net. 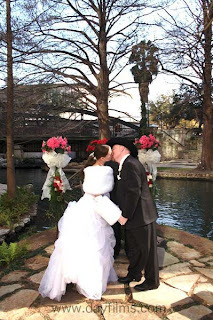 Rio San Antonio Cruises regularly uses its water taxis to transport wedding guests between hotels and ceremony and reception sites located along the city’s famed River Walk. “People wave at the guests as they go past,” says area wedding planner Jennifer Ramirez-Jasiczek. “It’s a lot better than walking.” And extremely scenic too. River cruise rates start at $80 per 20 people per trip, riosanantonio.com. Give your guests some independence with personal golf carts. Chicago-based wedding planner D’rita Robinson recently served up golf carts for a 225-guest destination wedding at Daufuskie Island Resort and Breathe Spa in South Carolina. The island doesn’t permit cars, so the golf carts were key to helping guests get around: “It just helps people go a little faster and easier. A lot of them don’t realize how helpful they are until they have them.” Rental fees average around $25 per day. Ideal for casual fall weddings, this one can be especially fun for kids. Thornapple Farms in New Haven, VT, has a 25-seat trolley pulled by two Percheron horses. It has a roof but no doors and is perfect for taking guests from a parking area to an out-of-the-way ceremony or reception spot. Rates start at $450 for two hours. Hayrides can also add to a fall wedding’s ambiance, but beware that some guests might be allergic to the hay, vthorsedrawnservices.com. Many wedding planners agree this is the most popular way to shuttle guests from one location to another—and the ride can often be an extension of the celebration. “People always have such a good time getting to know the people on the bus,” says Boston-based wedding planner Alexis Eliopoulos O’Mara. Greyhound Buses that seat about 50 people are available for charter, and rates start at about $380 for five hours, greyhound.com. Generally a more affordable option than a coach bus, packing guests into a big yellow school bus can provide a fun, relaxed and, for some, sweetly nostalgic ride. In fact, it proved an especially fitting service for one of O’Mara’s recent clients—a second-grade teacher. She personalized her school bus by displaying, in each window, drawings her students had created for the occasion. Contact your local school bus company for pricing information. Sightseeing or wedding-specific trolleys (white with minimal writing) are often employed by brides for toting their guests around town. Keep in mind: Sightseeing trolleys, while often the less expensive option of the two, are typically open-air, and many wedding guests (especially those who’ve spent a lot of time on their coif) don’t always love them. Wedding-specific trolleys, such as Kenny’s Coach in Weymouth, MA, are enclosed, climate-controlled and even offer complimentary champagne. The company charges $899 plus gratuity for three hours on a Saturday night, kennyscoach.com. What could be more picturesque for a winter wedding than transporting guests by sleigh? Denise Latousek of DL Event Planning in Aspen says that in the winter, a sleigh is the only way to transport guests to the popular Pine Creek Cookhouse in nearby Ashcroft. Guests are instructed in their invitations to bundle up and are treated to a 20-minute Clydesdale-pulled sleigh ride to the site on the couple’s big day. The sleigh ride costs about $25 per person, but group rates are available. Couples who’ve chosen to get married at the Aspen Mountain Club atop Aspen Mountain can shuttle guests to the summit with a 16-minute gondola ride. In the winter, guests can enjoy blankets and hot chocolate or hot cider, explains Latousek. Rates start at about $15 per guest during regular operating hours and $750 per extra hour it remains open. Boston’s famed land-sea vehicles, known for providing out-of-towners with a tour of the city, can also be chartered for weddings that take place downtown. Each DUCK seats about 32 people, and brides can request a specific color of boat as well as their favorite conDUCKtor, who can also point out the sights. Guests can be taken either by land or along Boston Harbor. Rates start at $675 for 80 minutes—the length of a normal tour, bostonducktours.com. Who says limos are only for the wedding party? Some couples treat all their guests to a luxury ride. This option works especially well for smaller weddings. Bauer’s Limousine in San Francisco has more than 40 limousines in its fleet, and group rates are available, bauerslimousine.com. all you need is your fiance and the marriage license. Give us a call. We are booking fast. 9am, 3pm, and 4pm is already taken. 1. Get a red carpet – require everyone to glam it up and if you are short on people to take pictures on the red carpet – hire the children. Give them press passes to hang around their neck and cameras that flash each time they press the button. 2. Pick a signature drink and keep the bar simple. It limits your need for various glasses and accroutremonts. 3. 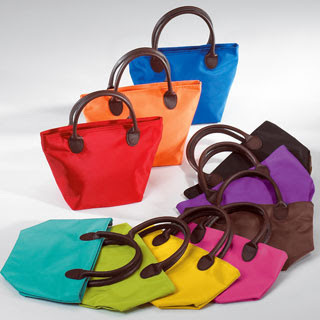 Be sure and have a wrap up best and worst dressed (keep it light-hearted). Fashion some type of award to give to the winners and losers. 4. Most of all – have a great time. We have a need for one time help for a large wedding on Saturday, February 17th. If you have ever considered the event planning business, this is certainly an experience to “cut your teeth” on. We are looking for a total team of about 6 people – so we have 2 more slots to fill. Please email if you think you might be interested. We require help from 3pm – 11pm. Our two full-time event planners will lead you in the right direction that evening.